Allan Pinkerton didn't seem to intend to be America's chief spy, not by a long shot. He left Britain in 1842, disappointed with his unfruitful work with the Chartists, a reformist movement focused on obtaining votes for all men whether they own property or not. He arrived in the US with his wife and set up shop as a cooper--a barrel maker. Pinkerton served first as Deputy Sheriff, and then as Chicago's first Official Detective. By 1850, he'd gone on to found the North-West Detective Agency with Edward Rucker, a Chicago attorney. The North-West eventually became the Pinkerton Detective Agency. Initially, the Pinks were the bomb. They patrolled the Wild West, stopping bank robberies, counterfeiters, and pretty much any law-breaking you can think of. A Pinkerton agent, Frank Geyer, helped crack the case of H.H. Holmes, the serial killer who haunted the 1899 Chicago World's Fair. Pinkerton himself pioneered many of the detective techniques that CSI and White Collar make use of now--tailing suspects, and undercover work included. As if that weren't enough, Pinkerton took a turn as the Union's spy-master general during the Civil War and put those techniques to work on the Confederates. He even foiled an assassination plot against Abraham Lincoln. The Pinkertons were everywhere. Their name became synonymous with private detectives. But every good dynasty eventually comes to the point of collapse. The Pinkertons' demise began when they were repeatedly used to protect strike-breakers by anti-union industrialists in the late 1890s. Andrew Carnegie and Henry Clay Frick hired them to break the Homestead Strike, resulting in the death of a Pinkerton agent by sniper fire. 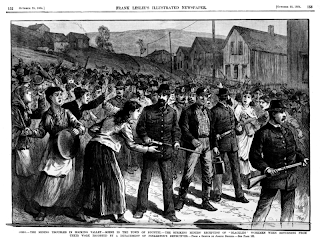 Franklin B. Gowen, a district attorney in Pennsylvania, hired them to help break the "Molly Maguires," a secretive Irish-based group of coalminers in Pennsylvania. Pinkerton agent James Ford Rhodes went undercover with the Molly Maguires, and while his detective work eventually led to the end of the Maguires, it happened amidst bloodshed. A vigilante group was formed that killed several, including one man's wife. Rhodes attempted to resign over the situation, but the damage was done. The Pinkerton name was blemished.